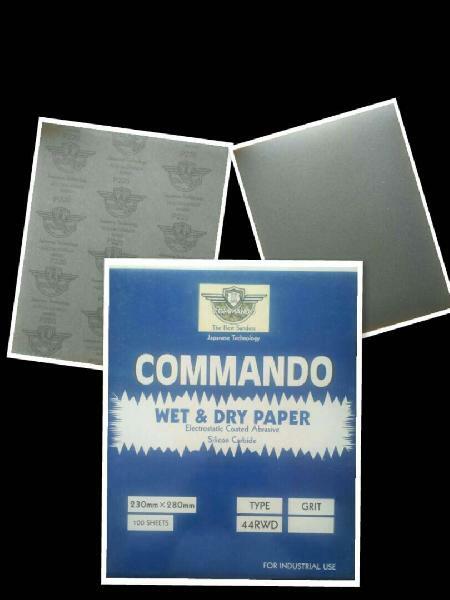 We provide our customers with a high quality range of Silicon Carbide Waterproof Abrasive Latex Papers in COMMANDO Brand. This 44RW LATEX WATERPROOF PAPER is ideal for both wet and dry sanding and is widely used for the polishing wood (Plain or Lacquered), painting Automobiles, Plastic, Ceramic and many Industrial uses such as Leather, and Mechanical components. All our products are widely appreciated across the country by our clients. Size - 9" x 11" or 280mm x 230mm. Packing: Beautiful 100 pieces air tight cover packing & 1000 Pcs master carton packing.